Manoug Parikian is best remembered for being the leader of the Philharmonia/New Philharmonia Orchestra in its halcyon days under Otto Klemperer and Herbert von Karajan in the 1940's and 50's imparting that particular string sound which is still uncannily clear on the splendid recordings which have come down to us from this era. These rare recordings date from the early 1970's and have Parikian playing with some top sewdish soloists of the time in repertoire by Mozart and Beethoven. The cultured nature of his playing is readily apparent in the Mozart Divertimento which sings along quite merrily and with panache, ably supported by Johnsen and Andersson who were also brilliant players themselves. The Beethoven Sextet is a lovely work, all too rarely heard these days and it comes across quite magically in this performance which truly belies its age. 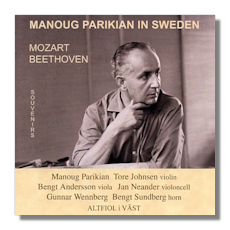 Here Parikian must have had fond memories of the horn playing of his Philharmonia colleague Dennis Brain but Wennberg and Sundberg are themselves hugely accomplished horn players and the music is sensibly and beautifully interpreted. Dating from the early 1970's, the recordings have come up quite well although a small amount of distortion is prevalent in loud passages. Notes provided are sketchy and brief with short biographies on the soloists and even shorter ones on the works themselves. However for those interested in some Parikian material, this is a most welcome disc.